CHECK FIT: The WR mag is made to 0.1 tolerances, and 0.15 to the mag release tang. The rifle receiver, stock and floorplate may vary up to nearly 1mm. 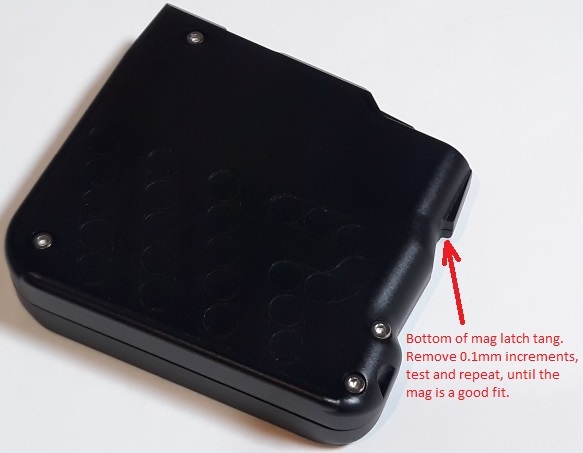 The mag may be tight to insert and remove. Remember, this is a precisely made magazine (perhaps too precise). There are tolerances from rifle to rifle, and action take-down screws can be done up to different tension (sometimes too much). If you think it will never improve, then simply use a smooth file and take 0.1mm increments out of the mag front latch locking tang, continuously testing fit as you go. BED IN: When you first purchase a WR mag, the follower may be "too sharp" or “too new”. The follower works best after it has cycled a few times to bed into the precise shape of mag internals. This will come with use, but this can be expedited by manually depressing and releasing the follower. a) CLEAN: Clean the mag internals with a suitable solvent, removing all grease and oil. b) DRY LUBE: Always dry-lube the internal of the mag. Dry lube need be applied to FRONT and REAR internals of the mag well (should not be needed on the sides, but wouldn’t hurt). The most common dry-lubes are Graphite powder, PTFE (Teflon) drying spray, or Silicone spray (non-greasy) drying. Do not use oil, grease or similar. c) CHECK: Ensure the follower flows freely in both halves before putting together. If it does not, there may be some foreign matter, damage, or the follower might be too new. The follower and internals are made to a tight tolerance at 21deg C, so the follower may need to wear a little. 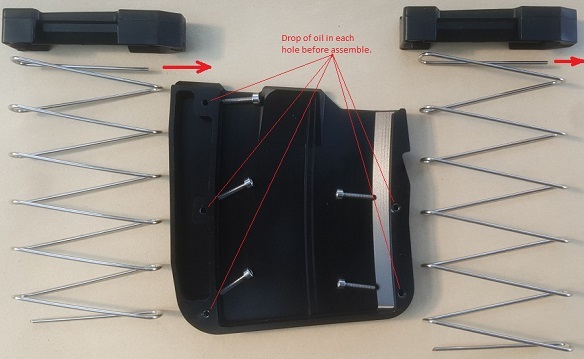 Expedite the wear by considering filing a little material out of front centre of the follower (so there is a convex curve to suite the front curve of mag internal). d) ANTISEEZE: Apply a tiny drop of an anti-seize to the clam screw threaded holes. Or, apply a small drop of synthetic oil (do not allow to run into the mag internals). The threads can “bind” due to Alum and SS electrolysis. Oil and ammunition do not mix. e) SPRING DIRECTION: Note, the spring tail at the top into the follower should point forwards, towards the front of the follower/mag (the base may be opposite facing, depending on mag model). f) ALIGN: Be sure to align the 2 body parts as best as you can. There is 0.05mm play in the screw holes, so it may require some manual alignment as necessary. g) TIGHTEN: Screws should be done up pinch tight (do not over tighten). Be sure there is no foreign matter in the threaded hole. Apply a drop of synthetic oil or anti-seeze applied to screw or in thread hole first. h) TUNE: If you are heading to a world championship, and performance is critical, you might want to "tune" the performance of the stripping force by very fractionally re-forming the spring free length. Be sure to NOT allow the spring to form a helical shape - twist with the coil direction while stretching. i) TEST: When assembled, test carefully. Take any appropriate corrective action. If in doubt, ask. FIT & FUNCTION: We let uses of these magazines do the talking for us...and their comments thus far have been tremendously positive, with only a couple of exceptions. We made these magazines for the fastidious shooter that wants the BEST match grade magazine available. Likewise, shooters of the Waters Rifleman mags are expected to have a fundamental understanding of how magazines work - understanding tolerances, movement due to temperature, round stacking geometry, etc. This is precision equipment, which precision is key and will not be varied. TIGHT IS BEST: Ensuring a tight and solid fit keeps your repeater rifle as close to par as possible to a bolt action single shot rifle. Tight and solid assembly and fixing keeps harmonic vibration even through the whole rifle, and helps dampen the vibration quicker (no intensity spots - hence why BR rifles have the receivers glued in, etc).